Buzz caught up with the Republican candidate for governor as he waved signs in Brandon. 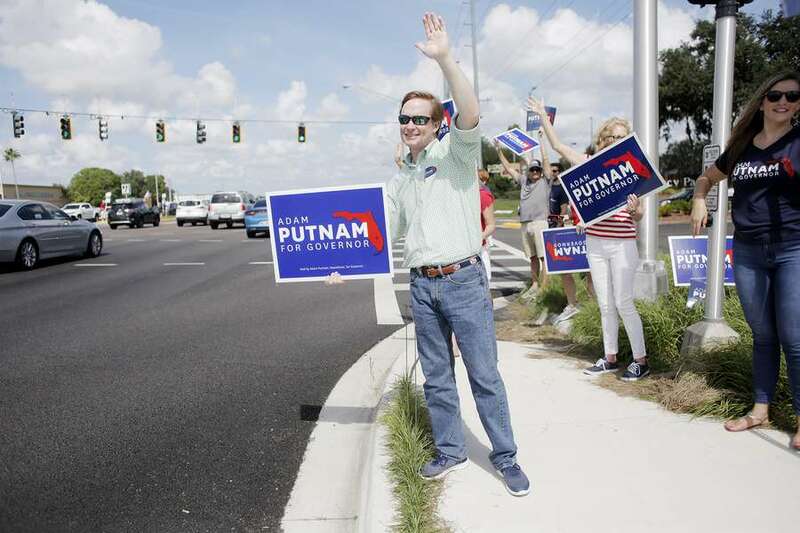 The blazing late-morning sun shining on his strawberry blond hair, a flushed Adam Putnam clutched a campaign sign Tuesday and waved as traffic zoomed by on Brandon Boulevard. A hard-fought race for governor had led the state's agriculture commissioner to this busy Hillsborough County borough, a spot that's hard to beat for maximizing the ratio of eyeballs to campaign signs. For Putnam, it's one of his last stops in what has turned into a fight for his political life. The Bartow Republican entered the race as the clear frontrunner, but that changed when President Donald Trump endorsed Putnam's opponent, Republican Congressman Ron DeSantis of Palm Coast. Polls now show the race coming down to the wire. Putnam said he's convinced he'll win after knocking on nearly 400,000 doors and holding 200 rallies. "No regrets," he said as supporters waved signs on all four corners of the intersection. "We've left heart and soul out there on the field, given every ounce of energy we've had to it. This is what grassroots politics is meant to be." The race between Putnam and DeSantis turned ugly at times. Putnam, for example, took a shot at DeSantis, 39, for appearing constantly on Fox News and only sporadically on the campaign trail in Florida. DeSantis questioned Putnam's loyalty to Trump. Throwing elbows is part of politics, especially in Florida, Putnam said. "Look, it's the third-largest state in the country," he said. "It's a competitive state. If it was easy, everybody'd do it." He cast today's election as "a choice between the Washington way and putting Florida first, and I believe Floridians are going to choose to put Florida first, to build on the strong economy we have. Washington ought to be operating more like Florida, not the other way around." Campaigning in Brandon makes sense for Putnam. He represented this area for years while in Congress, and it's on the far end of the crucial I-4 corridor. He had reinforcements in supporters like former Hillsborough State Attorney Mark Ober, who staked out a spot in a median to wave his sign as sweat beaded on his forehead. "I've known Adam for so long, and this race is critical," said Ober, who grew up in Brandon. "He's been a friend to law enforcement, a friend to the state attorneys, and I'm happy to be here for him. He'll be a great governor." Putnam said he was happy with the ratio of "five-finger waves compared to one-finger salutes" and that there seemed to be a "strong correlation" between enthusiastic support and mini-vans and pick-up trucks. "Adam Putnam for governor!" one man yelled, evoking hoots and hollers from the sign wavers. Others clearly weren't on his side. "Ron DeSantis for governor!" another man yelled. Still another bellowed something about "blue algae," presumably a reference to the goop that is choking South Florida's waterways. After about 45 minutes, Putnam and his supporters headed for their cars. They'd started the day in Orlando and now were headed back to Lakeland, where Putnam would have his traditional Election Day lunch at Fat Jack's Deli and Pub, cast his own ballot and then get back on the campaign trail. "If you don't vote, you don't get to complain," he said. "Don't wake up Wednesday and wish that there was something else that you could have done."